We'd like to welcome Supersonic Music as our newest business customer. Supersonic was making use of our *FREE* WiFi hotspots on Mass St., but wanted to upgrade to more reliable service. Unlike most ISPs, Wicked Broadband doesn't provide e-mail hosting, web hosting, backups and other services ISPs commonly provide. 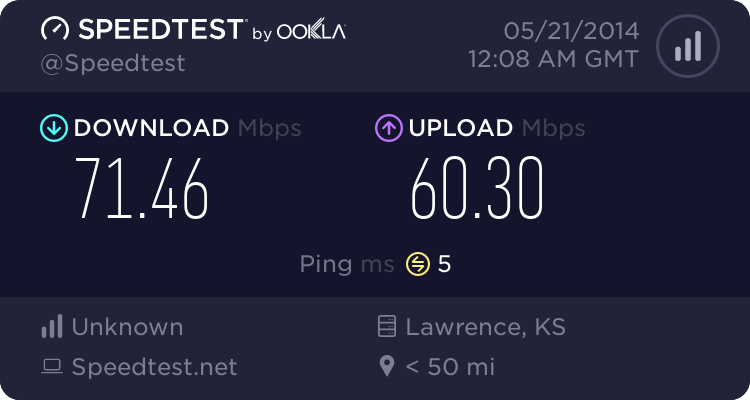 We stay away from this because we view the role of an ISP as a provider of a neutral pipe that connects your home or business to the Internet. We describe our business as moving 1s and 0s from point A to point B for a daily, weekly, monthly or annual fee. With this in mind, we have decided to get out of the business of providing domain name resolution (DNS). Many other companies are offering free DNS services that are faster and more reliable than anything we can provide. If you don't know what I am talking about, don't worry about it. Your IPs are likely set automagically and you can ignore this message. One of our primary Uninterruptable Power Supply (UPS) units died on us today after 7 years of loyal service. As a result we had two brief outages that effected a good chunk of our network (around 40%). One at noon when the unit failed and another at 1700 when a breaker blew on the replacement circuit. We've addressed the issue and shouldn't have any more unplanned down time due to this failure. Our apologies for any inconvenience this may have caused our customers. The FCC today voted to implement rules that will allow ISPs to discriminate against traffic that doesn't enhance their bottom line. This means that AT&T, Comcast and yes, even WoW! will be able to set up Internet fast lanes for "revenue enhancing" customers at the expense of other services. This is a huge change in how the Internet has historically worked. It means a shift from an Internet where anyone can set up a website or service to an Internet where only "major players" will be able to create and deploy new and novel websites and applications. It means the Internet "free and open" model will move toward the "closed and exclusive" model we see in Cable TV. Companies that provide services that compete with cable (like Netflix for example) will be forced to pay Cable TV companies a toll in order to move their content. Where will the fee come from? Your pocket. Lets say you subscribe to Comcast for example. You pay Comcast to bring you Internet traffic from everyone on the Internet. Lets say you subscribe to Netflix too. Well then part of your Netflix bill will be used to pay Comcast to provide Internet traffic to you. So Comcast gets paid twice. Once by you directly, and once indirectly through your Netflix bill. If a company is trying to start a service that competes with Netflix, they will have to negotiate passage with Comcast first, then they will need to advertise and compete for customers, then they will have to negotiate with content owners (a major content owner is Comcast by the way). A very tall order and one of the reasons why over the top (OTT) television is not available here in the United States. We here at Wicked Broadband oppose this change. It will be bad for consumers, bad for the Internet and ultimately bad for American innovation. The growth of Information Technology companies like Google, Amazon, Facebook and others has been a ray of light in a world where traditional American manufacturers are shrinking. This change will all but ensure that future innovation on the web takes place outside of the USA. I'd like to encourage you to contact the FCC and let them know that you oppose this rule change. As long as you are paying your ISP for Internet service, all of that traffic should be treated the same. Special thanks to Lionell and Travis for all of the hard work they've been doing the past couple days. Storm damage is the bane of our spring season, but they've visited over 40 sites that were damaged by lightning, wind and water. They are down to 10 sites as of this evening and may have the network back to nominal by tomorrow afternoon. Joshua is going to be away from work for a couple weeks due to an emergency in our family. We've also recently had some personnel changes and so our new technician hasn't finished his training. Since we are so short handed, we've decided to suspend new customer installations through May 18. We'll resume installations at that time. We apologize for any inconvenience. The down side to working with small locally owned businesses is that they have very little depth in any given position. The up side is that you get personal attention (our customers are names, not numbers) and you can get the owner on the phone if you want to.